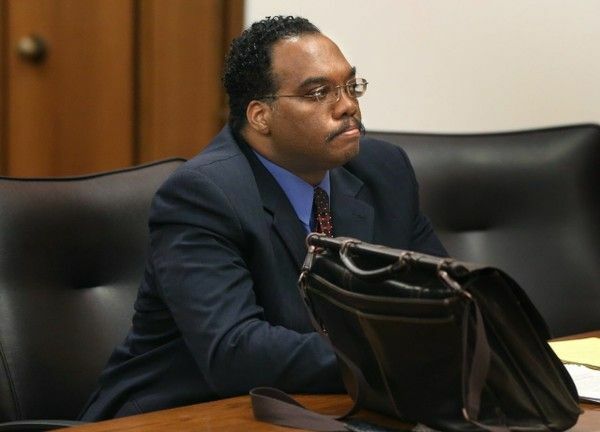 SHAKER HEIGHTS, Ohio -- Lance Mason, who was accused Saturday of fatally stabbed his estranged wife at her home, had served as a former prosecutor, state lawmaker and Common Pleas judge. But Mason’s fall from grace began four years earlier, in 2014, when he brutally beat his wife in front of his two young children. At the time of the attack on his wife, Aisha Fraser, Mason was a Cuyahoga County Common Pleas judge. In 2015, he pleaded guilty to the attack, during which he punched his wife 20 times and slammed her head against the dashboard of his car five times, breaking an orbital bone. Mason was born on Aug. 26, 1967, according to court records. He told Crain’s Cleveland Business in 2001 that he graduated from Shaker Heights High School and received a bachelor’s degree in political science from the College of Wooster. He went on to receive a law degree from the University of Michigan Law School in 1992. Mason’s first job out of law school was with the regulatory division of the U.S. Department of Agriculture. He handled cases such as the prosecution of meat producers who masked spoiled meat with chemicals, he told Crain’s Cleveland. Mason then served as an assistant prosecutor in Cuyahoga County, according to his Ohio Statehouse page. He handled several felony cases, including capital murder, kidnapping, felonious assaults, rapes and robberies. Gov. Ted Strickland announced in August 2008 that he was appointing Mason to fill a vacancy on the Cuyahoga County Court of Common Pleas, cleveland.com reported. He resigned from his Ohio Senate seat to take the job. Mason earned $76,173 per year as a state senator, and $121,350 as a judge, according to cleveland.com. A woman exiting an RTA train about 12:10 p.m. called police after witnessing two people fighting inside an orange SUV driving down Van Aken Boulevard in Shaker Heights. The caller said the SUV slammed on the brakes in the middle of the road. The caller said she saw “fists flying” inside the car. Fraser Mason called 911 and flagged down a passing driver who drove her to South Pointe Hospital in Warrensville Heights. Cleveland police arrested Mason about 12:45 p.m. and confiscated smoke grenades, semi-automatic rifles, a sword, a bulletproof vest and more than 2,500 rounds of ammunition from the couple’s home. A member of Mason’s family called Cleveland police to say she was afraid he was going to use weapons inside his home to commit suicide, the report said. Police arrived and Mason surrendered. Once inside a police car, he admitted to having weapons in his bedroom and the attic of his home. Mason was taken to Shaker Heights Municipal Jail. Shaker Heights officials announced Mason had been arrested and Fraser Mason was hospitalized following an attack that took place in both private and public. Prosecutors charged Mason with assault, a second-degree felony. Charging documents indicated that Mason punched his wife 20 times and slammed her head against the dashboard of the car five times, breaking an orbital bone. She needed to get facial reconstructive surgery as a result of the incident. Their daughters, ages 6 and 4 at the time, were in the backseat. Fraser Mason filed for divorce. Their divorce is still not finalized, court records show. A Shaker Heights Municipal Court judge granted a protection order against Mason, barring him from being within 500 feet of his wife or children, cleveland.com reported. More than a year after the incident, Mason pleaded guilty to attempted felonious assault and domestic violence, cleveland.com reported. A few weeks after, the Ohio Supreme Court suspended Mason from practicing law. He submitted his resignation as a judge on Sept. 15, 2015. Mason was sentenced by Cuyahoga County Common Pleas Judge Patricia Cosgrove to two years in prison. He served nine months and was released in June 2016, cleveland.com reported. Suspended indefinitely from practicing law, Mason remained out of the public eye after being released from jail. He was ordered to pay a $150,000 judgment to Fraser Mason in a civil case for damages after the attack. His name reemerged in the fall of 2017 after he was hired by Mayor Frank Jackson in late August as Cleveland’s director of minority business development. Mason was one of 13 candidates for the position, but was handpicked by Jackson, who was up for re-election. A city official said Mason was the most qualified applicant for the $45,000-a-year job. Jackson won re-election and Mason continued to work for the City of Cleveland. Shaker Heights police responded about 9:30 a.m. to a home on the 17600 block of Chagrin Boulevard for a domestic dispute that cleveland.com sources said involved Mason and Fraser Mason. Mason had fatally stabbed Fraser Mason, sources told cleveland.com. Mason tried to flee the scene in a black Audi SUV, but struck a Shaker Heights police SUV, injuring both the officer and himself. Mason and the officer were each taken to the hospital Saturday. Mayor Frank Jackson terminated Mason’s employment Saturday evening based on felony charges stemming from the incident in Shaker Heights. “I extend my deepest condolences to the family of Ms. Aisha Fraser, especially to her children,” Jackson said in a statement.